Pour lemonade straight from your blender, or pour into a pitcher. 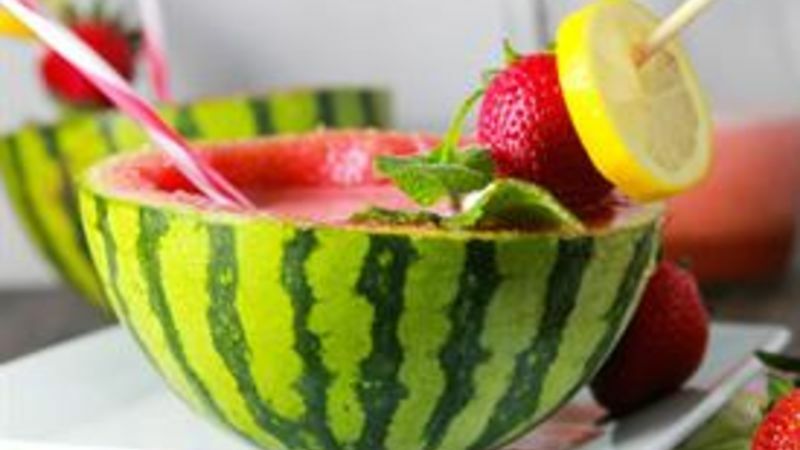 For an extra fun way to serve this drink, pour it into the two empty halves of the watermelon, add a skewered strawberry and lemon for garnish, then slurp your lemonade from a straw! Wow your summer pants off with this strawberry-watermelon lemonade. Yep. Strawberry. Watermelon. Lemonade. Imagine it. A lazy summer day. You've planned a picnic with the hunkiest chunk of human ever. You're ready to wow. There are little finger sandwiches. Dainty homemade cookies. And cups of lemonade. Whaaat? No! Not just any lemonade. We're talking THE lemonade. Pink lemonade. No, not just pink lemonade. We're talking this ultimate pink lemonade: strawberry watermelon lemonade. Because how else are you gonna wow that partner in picnicking if you don't have something super to sip…out of the same straw? Yeah, we don't know either. Good thing you won't have to find out. Just grab this stuff 'n make it! Here are more lemonade recipes sure to make any picnic or barbecue the best ever.